A broken hip commences, or greatly speeds, the decline of many people after age 65. Assuming you’re standing upright into your seventh decade, anything that prevents a fall or a fracture on impact could win you years of life and independence. Get started early, however, and there will be time to bank bone density. By eating well and exercising, that is, especially before 30, people can stimulate bones to grow strong and stay that way longer. Fit individuals sometimes have terrible bone health, including a surprising number of young female athletes, LeBlanc says. When she and Hawkins studied a group of high-level male runners, they found that some had osteopenic spines in spite of doing about 100 miles a week. Bone density in their lower bodies was fine. 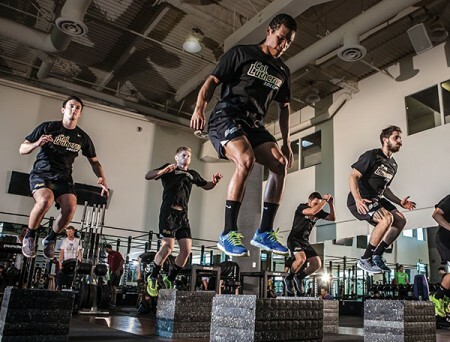 People in low-impact sports like swimming and cycling would do well to train with exercises such as burpees that use body weight for resistance, or to try out jump training, aka plyometrics, as shown in the photo. Luckily, these exercises are popular now with young people. Jump training stimulates bone with large forces that are delivered quickly. The peak impact on landing is seven to 10 times your body weight. Shoot for symmetry in forward landings. Asymmetrical falls – which become more common with fatigue – are linked with injury. Don’t keep leading with a dominant leg. Your right-side landings should be a mirror image of landing left. Jumping down from boxes in different directions – front, side and diagonal – will maximize bone growth. Be cautious about the height and avoid very long jumps to one side. Those could easily tear the anterior cruciate ligament (ACL) in a knee.